La Digue is a gorgeous island and certainly resembles a paradise. You should definitely visit this place if you ever travel Seychelles. La Digue is one of the paradise islands in Seychelles and I am not exaggerating when I say it is the most beautiful one. It is small, with about 2500-3000 people living here, which is why it is easy to explore this place. You can either walk or just cycle around and cover the entire island in a day. This gorgeous island lies next to Mahe & Praslin and has some of the most amazing beaches in the world. 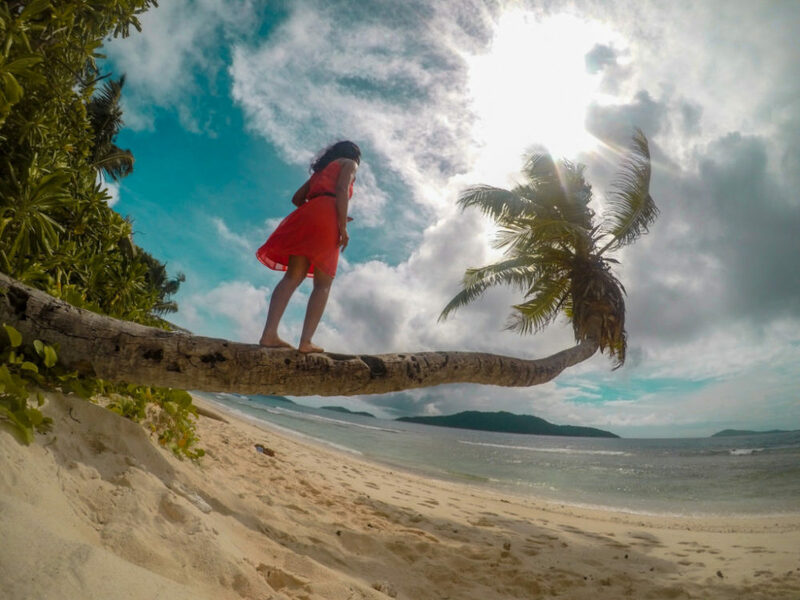 Every day, countless people journey to this island to get married or explore its beauty. And, they often leave with some amazing memories and photographs as well. I am one of those countless people and in this article, I am going to cover all the best aspects of this island. So, if you ever plan to visit La Digue, then this is your go-to guide for all the details. Also, you can check out our Seychelles complete guide for information on this amazing country. There are two ways in which you can reach La Digue, depending on your budget and convenience. However, there is no flight available for this place, direct or indirect, as it doesn’t have an airport. You can take either a ferry or a helicopter to reach the place or could contact several tour operators offer day-trips too. One thing to keep in mind is that, in reality, there is no direct ferry from Mahe to La Digue. 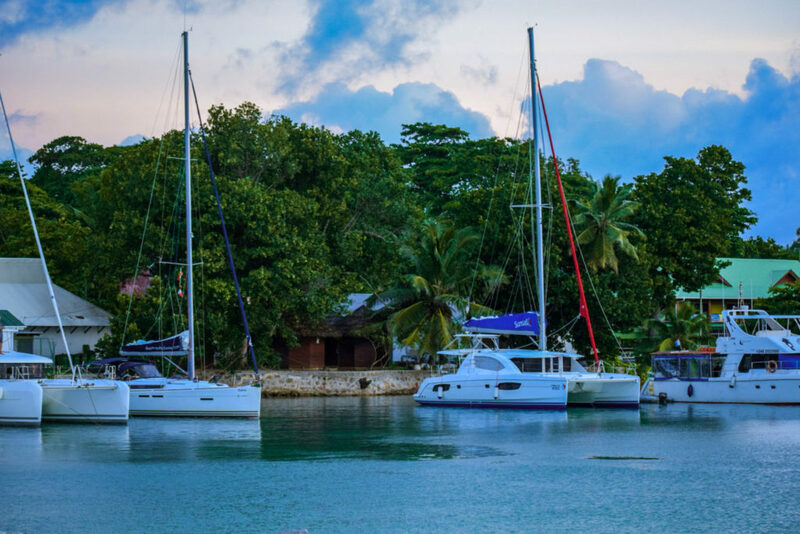 You will have a connecting ferry from Praslin to La Digue which would take about 2 – 2.5 hours in total. It takes about 1.30 hour to reach from Mahe to Praslin and about 15 minutes from Praslin to La Digue. It would cost you somewhere around 128 Euros for the entire ferry connection if you book it online. However, if you get the tickets issued with the help of a local then the cost is considerably lower. There are also helicopter services to this island from Seychelles Airport so you can opt for that too if you are looking for a quick transportation. However, keep in mind that this will definitely be costly in comparison to the ferries. Once you have reached La Digue, you can hire a bicycle to reach your accommodation if you have light luggage. However, if you have a lot of luggage then it would be advisable to take a golf cart which will cost you approximately 100-150 Seychellois Rupees (500 – 750 INR). Taxis are really expensive here and won’t go for less than 250 Seychellois Rupees (1250 INR) so, try to avoid them. Although La Digue is small in size, it consists of many amazing places that you can’t afford to miss out on. Most of the places on this island offer free access so, you don’t have to worry about the price too. Here are a few places that I would definitely recommend you to visit if you have a few days with you. If you happen to love nature and just enjoying a pleasant morning or evening walk, then Veuve Nature Reserve is the place for you. 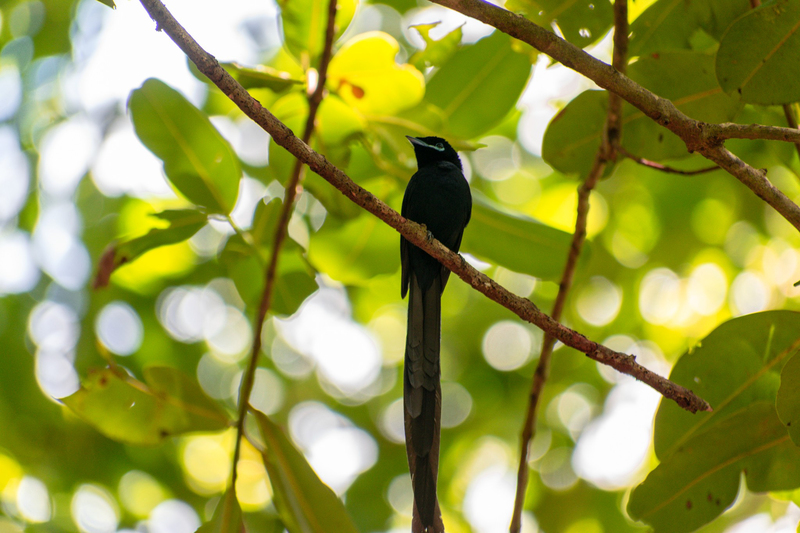 You can spend about 1-2 hour here, just walking and enjoying the woods and if you are lucky, then you might even notice Seychelles Paradise Flycatcher here. One of the most photographed beach in the entire world, Anse Source D’Argent is another must-visit place on the La Digue island. The rock structure here is quite unique and adds a nice backdrop to your photographs which is why it is so popular. The beach is quite long too and is usually crowded in the morning as people come here to relax on their day trips. 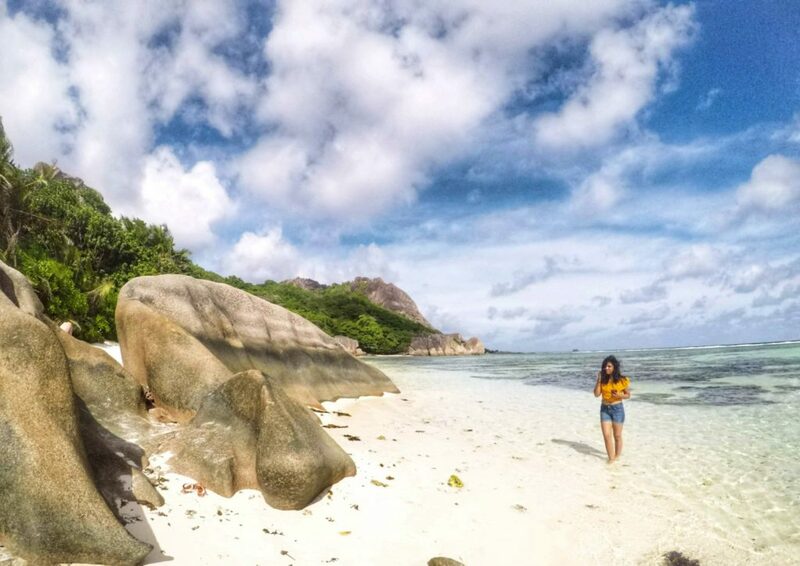 You can access this beach through the L’Union Estate Farm by paying an entrance fee of 115 Seychellois Rupees (575 INR) which allows you entry for the entire day. This is one of the most popular places to visit in La Digue because it holds many amazing sights and views for the explorers. 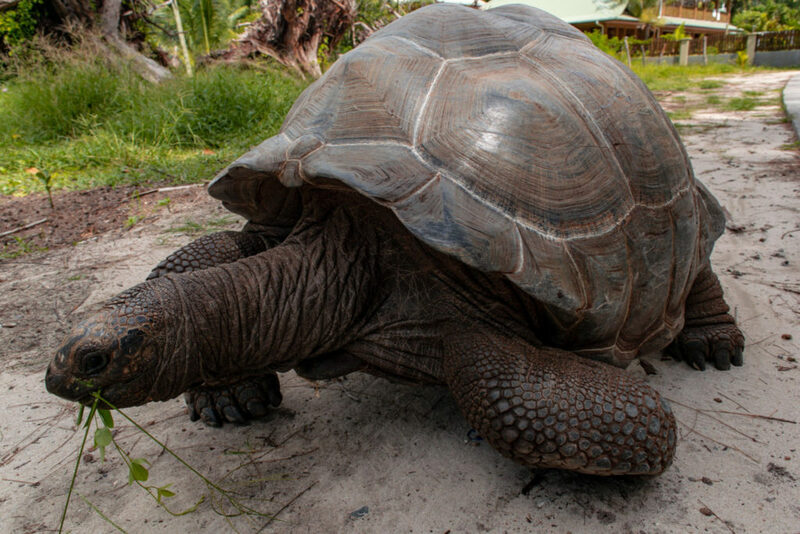 Apart from housing coconut and vanilla plantation, this place also has a tortoise farm where you can interact with the famous giant tortoises. You can feed them and click pictures of them or you can just head to the famous Anse Source D’Argent beach. It is entirely up to you. There is also an art gallery and souvenir shop here so visiting this place is a must. Another amazing beach to check out in La Digue is the Anse La Reunion which is on the left side of the Jetty. You can enjoy a perfect sunset view from here and can just chill on the beach with a couple of beers and snacks. If you are looking for a nice beach to relax and chill, then Anse Severe is certainly one of the places to visit. You will find here many other tourists and locals just hanging out with their family or friends to enjoy a quiet, beautiful evening. If you wish, then you can swim here too and make the most of the clear, blue water. Another great place that you might find interesting to hang out at is the Grand Anse Beach, which is the perfect picnic spot. However, don’t try swimming here because the waves are too strong and could easily wash you away from the shore. Reaching this beach would require a 20-30 minutes hike but the view would be so worth it. Anse Cocos is another great place which is perfect if you are looking for a little seclusion from the tourist areas. Not everyone will hike to this beach so you can enjoy a lot here. This is the ending beach on the La Digue island, after which you will reach Anse Cocos by hiking. You can cycle to this place and enjoy some quiet, alone time while looking out the beach. Also, the path to this beach is gorgeous too. So, make sure you don’t miss this beach in La Digue. While you might think that since this is a small island and there aren’t many activities to do her, it is completely untrue. 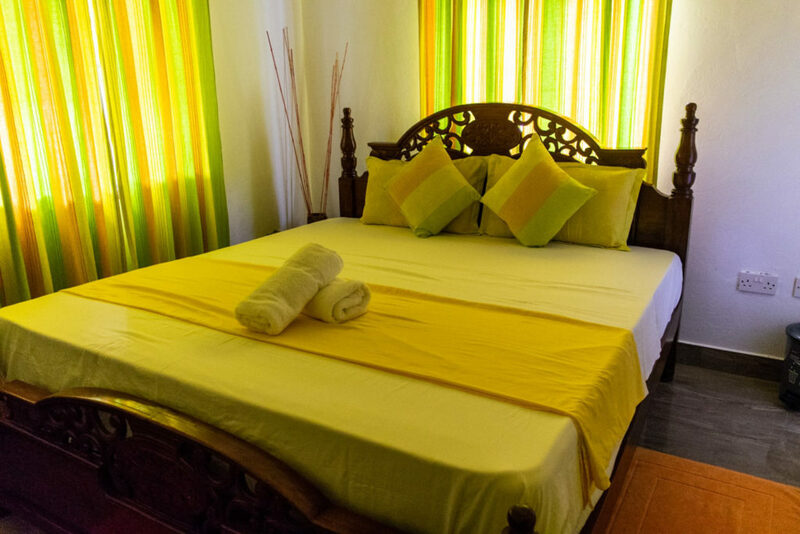 You need at least 3-4 days to enjoy your stay in La Digue completely and sometimes, those are less too. Here is a list of activities that you can indulge in during your time on this beautiful island. If you love hiking then you would definitely enjoy this. Hiking to Anse Cocos is quite exciting and amazing and allows you to visit the secluded beaches of La Digue like Anse Cocos and Anse Petite. There are two hike routes which will give you the adrenaline rush that you so desire, after which you can relax on the beach and just chill for a while. The best thing you can do in La Digue is to just explore the island on a cycle and make the most of it. The roads are quite smooth and nice and it will take you hardly an hour to make the entire island circuit. You will see that most of the people cycle around here for a calm and stress-free environment. On La Digue, you can feed the turtles and see how they live and spend their days. You will find the tortoise farm inside the L’Union Estate farm where you will find all size of turtles, from baby to grandpas. Trust me, feeding them leaves is quite amazing and is a great way to spend some time here. 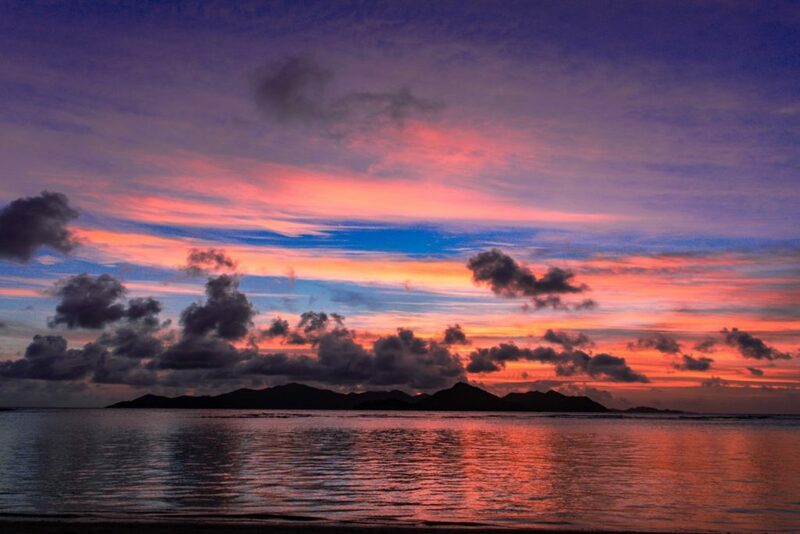 Seychelles is not only known for its amazing beaches but the mind-blowing sunsets too. So, if you are a sunset lover like me too, then you have to head out to Anse Reunion. The colors of the sunset are surreal, painting the sky with different shades of violet, red, orange, etc., giving it a really magical look. 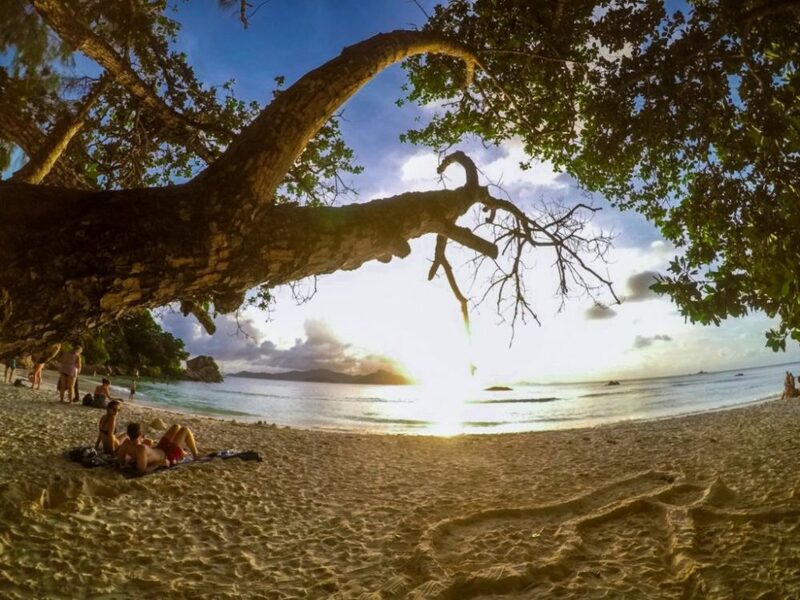 If you want to click some Insta-worthy pictures then you have to definitely head out to the Anse Source D’Argent beach. The boulder structure and the turquoise water here makes this a great place to click some really gorgeous, professional pictures. One of the most famous drinks in Seychelles is the Takamaka Rum which you will find in all the local or grocery stores. So, if you like partying and trying new drinks then you should definitely try this unique alcohol here. There are many flavors to choose from so you can experiment a little when you are here. It goes without saying but, if you are in Seychelles then you have to experience scuba diving or snorkeling once and La Digue is the perfect place to do that. The water around this island is really clear which will allow you a nice view of the flora and fauna. So, get your swimming gears on and have some fun here. As I mentioned earlier, Anse Fourmis is a quiet and beautiful beach to spend some time. But, what is even more interesting about this beach is that you will find a low-hanging palm tree here which you can climb. There are countless pictures of people climbing this magnificent tree so, if you want one too then you know where to head out now. Now, you might be wondering how to go about on this tiny island. Well, traveling on La Digue is quite simple and easy so you don’t have to worry too much. One of the most popular modes of transport on this island is cycles which cost 100 – 150 Seychellois Rupees (500 – 750 INR) per day. Cycles are the best way to cover the island as it hardly takes you any time and you don’t get exhausted too much. Plus, the view and the roads are really nice so you are likely to enjoy cycling around here. If you don’t mind then you can walk here too. It might take a little more time than cycling but you can easily reach the places in just 30-40 minutes. There are many hotels and resort golf carts available too so if you want to transfer your luggage or belongings from jetty to the hotel or vice versa, then you can use them. They may charge you anywhere between 100 – 200 Seychellois Rupees (1000 INR), depending on the distance and your negotiation skills. While you might find fewer eatery options in La Digue, you certainly won’t die of hunger. Here are a few options that you can check out for eating. There are not many takeaway options in La Digue, like Mahe but you will still find 4-5 takeaway shops on the main road. There is Gala Takeaway which is quite popular and several snack shops from where you can purchase food too. It will cost you somewhere around 50 Seychellois Rupees (250 INR) per meal and you will find a wide variety of options here, from fried rice to curries. Apart from takeaways, you will also come across several restaurants and cafes here which will not only offer you an amazing beach view but free WiFi too. However, food at these places will be expensive and will not come less than 300-500 Seychellois Rupees (1500 – 2500 INR) per meal. One of the most economical and convenient options for food in La Digue would be to cook yourself. This can be easily done if you are staying in a self-catering apartment as you just need to get the ingredients and then use the kitchen to cook something else for you. 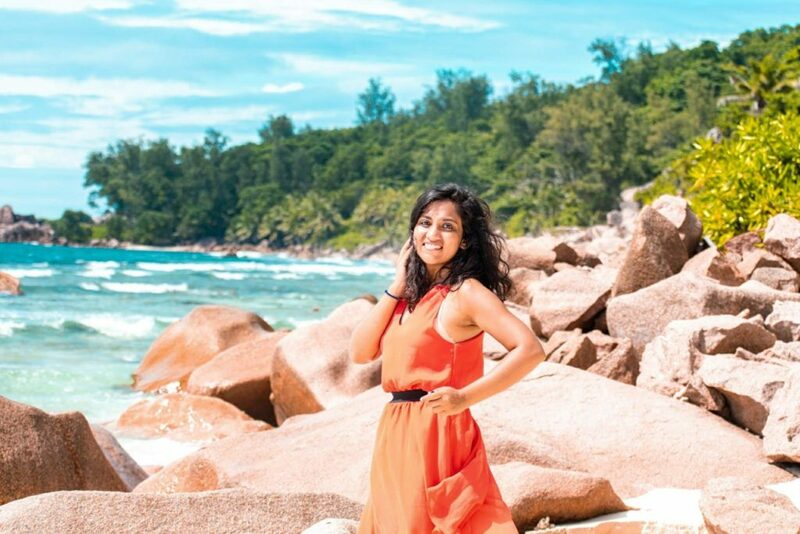 I was able to keep my food cost to about 200-300 Seychellois Rupees (1000 – 1500 INR) for the entire duration that I stayed in La Digue. If you are wondering about accommodation options in La Digue, don’t worry. I have covered that too below. There are a lot of hotels and resorts in La Digue that you can book for your stay which will cost you 50 – 70 Euros for a night. Some are more expensive so be cautious when booking your stay. If you have some apps then you might find some deals too which could bring the cost lower to 40 – 45 Euros for a night. If you are looking for a more economical option then choosing a guest house or a self-catering apartment would certainly be better. There aren’t any hostels here so you might have to shell a few extra bucks, but self-catering apartment could be a great way to reduce your overall travel cost. You will easily find a self-catering apartment for 30 – 40 Euros per night which can help you in cutting your food and water cost too. La Digue is a tropical island so you will experience a hot and humid climate throughout the year. However, the monsoon starts in May here so you might experience intermittent rainfall throughout May, June, and July. Usually, the days are warm and sunny here which makes it a perfect place to relax on the beaches. The rest of the year, you will experience a warm and sunny weather and fewer rainfalls. Apart from all the detailed information provided above, here are a few tips to help you out. If you don’t want to end up paying a lot of money for renting cycles, then I would advise you to refrain from renting it from the rental shops near Jetty. Instead, ask around a little and ask your hotel or accommodation place too before you rent it. There could easily be 50 Rupees (250 INR) difference that you could have avoided by being careful. You will find huge supermarkets and several grocery shops here which would sell you things at a different price. If you want to be sure that you are paying less then always buy food and drinks from a local, small grocery store instead of a big supermarket. Dining in a restaurant might sound like a nice idea but it can be really heavy on your pocket. 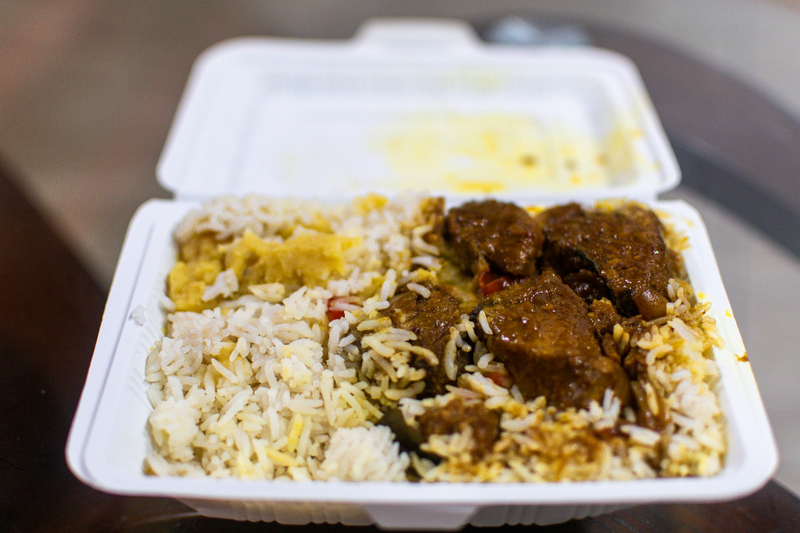 Instead, you can get food from the takeaway stores where it will be cheap and filling too. Love cooking? Even better because you can simply buy the ingredients from the store and prepare your own food, which will be healthy and economical. As I said earlier, self-catering apartments are the best way to reduce your overall trip cost. You get not only a nice and clean place to stay but can prepare your own food. Also, don’t forget the free water that you will get. 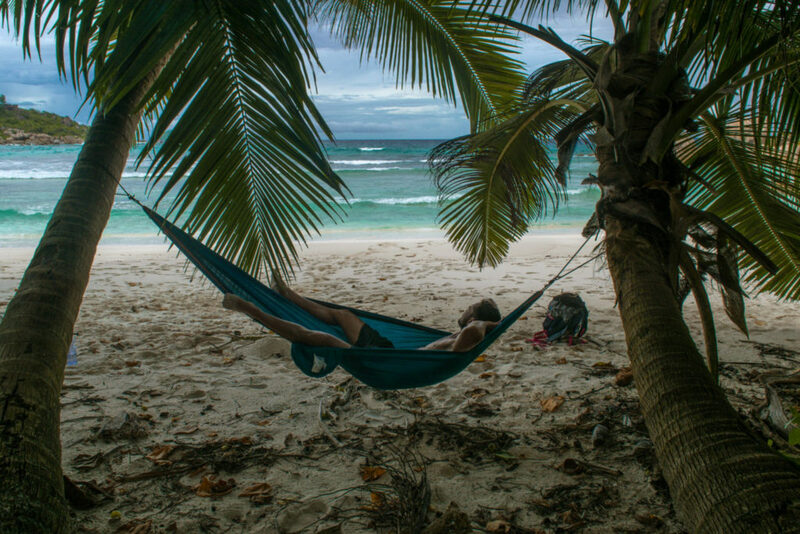 While it doesn’t take a lot of time to hike to Anse Cocos and Petite Anse, it is better to keep an entire day aside. This will allow you to enjoy properly. Trust me, you wouldn’t want to reach those beaches only to return back in just 15 minutes. This doesn’t mean that you would miss your ferry intentionally. It basically means that local ferries from La Digue to Praslin aren’t too strict. So, if you have a ticket and you miss your ferry, you can simply catch the next one, without paying any additional cost. Also, if you happen to reach 5 minutes late to the Jetty, then the ferry will turn back to pick you up. So, don’t sweat it too much. Since it is a tropical island, La Digue is swarmed with mosquitoes which will bite you all night long. So, it is better to take a mosquito repellant to protect yourself from all the mosquito bites. If you plan to cycle at night then make sure you have a torch with you. Most of the roads are dark and without any street lights. This will ensure that you don’t fall off the edge, directly into the ocean.